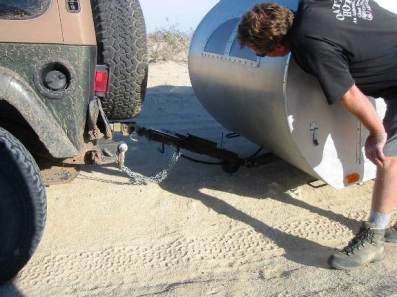 This is intended as a simple method to work out the tongue strength required for teardrop trailers, although it could be used for other types of trailers. It is a simplified combination of two official tongue strength guides but was not created by an industry professional, so there are no guarantees about its accuracy. There is an Excel spreadsheet you can download to work out an exact answer for your trailer design or, even simpler, a one-page look-up table to use for common tongue sections. 3) the maximum loaded weight of the trailer. Dave Nathanson was kind enough to report his tongue collapse and give permission to use this photo. Using the off-road category, an estimated 40 inch tongue length and 1100 pound trailer weight shows the original 2”x2”x1/8” square tube tongue was only about 60% of the required strength. As it took quite a bit of off-road travel before the tongue broke, this suggests the result is about right. Select the category of use that matches how and where the trailer will be used. Teardrop trailers with the axle well to the rear will have a higher than usual tongue weight, and for these consider moving ‘up’ one category in strength. - consider for braked road trailers that have a high tongue weight. - consider for unbraked road trailers that have a high tongue weight. - for trailers used mainly on-road not fitted with brakes. Three different type of tongue design are allowed for and the diagram shows where the tongue length is measured – twice for the composite tongue, where the strength needs to be checked in two places. The A-frame tongue is structurally the best as it has great horizontal stiffness and it transfers the hitch load directly from the coupler to the side rails. For the other two designs, an extra cross-member is required in or under the main frame. In order to calculate the tongue strength, you need to have an estimate of the maximum loaded weight of the trailer (GVWR). Here are some suggestions for typical teardrop trailers – not applicable to other trailer types. The Australian trailer regulations used for the off-road section of this tongue strength method require the same strength horizontally as vertically and there is some evidence that trailers with tongues which are not stiff enough can suffer from ‘shimmy’ (side-to-side oscillation). So it makes sense to design the tongue so that it has about the same strength sideways as vertically. 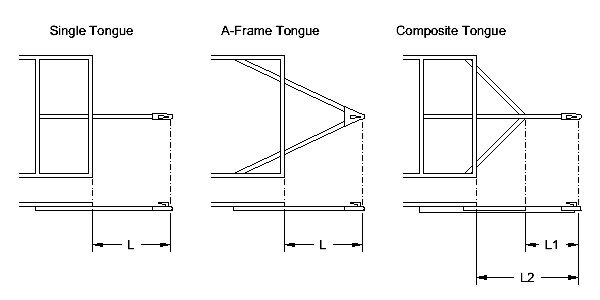 A-frames are always stiffer/stronger sideways than vertically, but single tongues are at risk, so pick a tongue section that has about the same horizontal and vertical strength. To help this, the single tongue section of the spreadsheet shows horizontal strength as a percentage of vertical strength and values below 80% are in red. Single tongue trailers that suffer from shimmy can usually be cured by adding diagonal braces to convert it to a composite tongue. The connection to the main frame needs to be as strong as the tongue and this can be a problem for single tongue trailers. - The ‘bury’, B, of the tongue into the frame should be at least half of either its exposed length, L, or the frame width, W.
- The section used for the second cross-member should be of roughly similar strength to the tongue – or at least not a lot weaker. The previous teardrop tongue strength page used the Australian trailer regulations. Feedback has shown that these are plenty strong enough, but also stronger than commercial teardrops that don’t suffer from tongue failures. So the idea developed that a tongue half as strong as the Australian rules was OK for a teardrop, which won’t get abused like the utility trailers which the rules may have had in mind. There is an International Standard, ISO 7641, for tongue strength and this appears to be more suited to on-road trailers, so the two methods have been combined. Only the vertical strength part of each method has been used as this seems to be the main issue with tongue strength. For the record, the Australian rules want the same strength horizontally side-to-side and three times the strength horizontally fore-and-aft, compared to the vertical strength. Australian trailer rules for design load, but with ISO 7641 calculation method used. It’s worth pointing out that ISO 7641 says that it can only be used on trailers with tongue weight ratios of up to 10%. Many teardrop trailers will have tongue weight ratios that are higher than this. So I have suggested that for trailers with a high tongue weight ratio, users should consider using the next category ‘up’.